Despite the merging of SEP (Boy Scouts of Greece) with National Youth Organization, the scouting spirit never left the hearts of those that had given the Scout Oath. That fact became obvious when the free nation got broken down by the invaders, in Spring 1940. During the whole of the Occupation, the former Scout Troops were meeting in secret and were preparing the reestablishment of the Corps at the same time they organized the offering of services to the resistance organizations, to the Hellenic Red Cross and to the wretched population. Patience, optimism and solidarity were the symbols of those young Greeks during their silent campaign to relieve their stricken fellowmen. A lot of them paid their devotion to the national and scouting ideals with their lives. In 1942, the free Greek Government in Alexandreia, Egypt, instituted a temporary Executive Board of Scouts of Greece under "crown prince Pavlos" (who was named Emeritus President of the Board). Shorlty after that, D. Alexatos, a Reserve Officer of the "royal Navy" along with Captain G. Leloudas and former SEP staff, organized a Seagoing Scouts Troop in "royal Navy's" warships and services. That Troop consisted of late Scouts that, at that time, were serving in "hellenic royal Navy" in Egypt. After some mutinous movements were noted there, the Seagoing Scouts organized a penitentiary camp in Kasfaret, Souez where they sent 300 sailors' children that were mislead by mutineers. In August 1943, G. Vlaxos and T. Gkazianis instituted Scout Troops in the Refugee Camps of Middle East to keep the refugees' children occupied. The results were impressive. 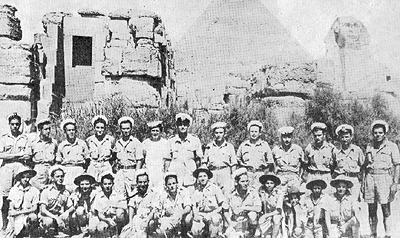 In Athens, summer of 1944, major former staff of SEP under the leadership of K. Melas, A. Benakis, M. Mindler, L. Pteris and others, started meeting in secret (despite the strict directive of the Occupational Forces) in order to set up the basis of the revial of the Hellenic Scout movement. In parallel, just before the liberation, groups were formed to assist the nation for the time it would take the Government to arrive from abroad.